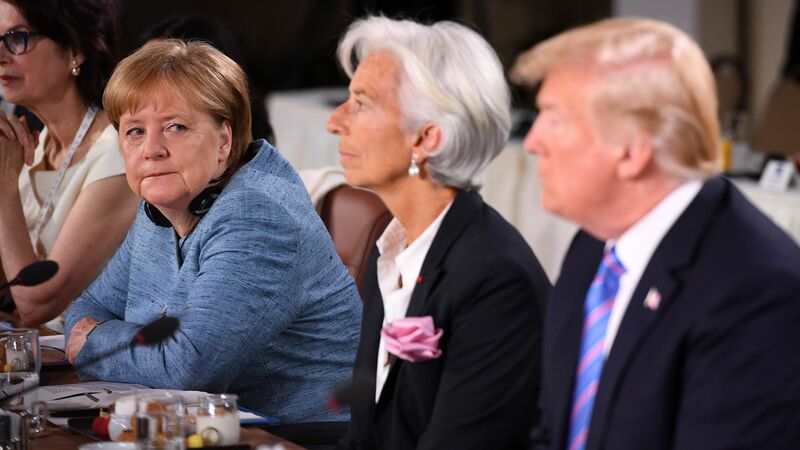 Merkel: Trump's G7 message withdrawal is "sobering" and "depressing"
German Chancellor Angela Merkel on Sunday called President Trump’s abrupt decision to withdraw support for a G7 communique “sobering and a bit depressing” and cautioned that the European Union, like Canada, will impose counter-measures against U.S. tariffs on steel and aluminum, per Reuters. The details: Her remarks add to the international backlash over Trump’s surprise withdrawal from the G7's joint message via Twitter on Saturday en route to Singapore for a summit with North Korean leader Kim Jong-un. Merkel said in a televised interview that the G7 debacle didn’t mark the end of transatlantic partnership between Europe and the U.S., but added that Europe will not rely on the U.S. and will take steps to protect its own interests. Another key highlight: Merkel said that Russia should be allowed to rejoin the G7 only when a peace plan for Ukraine can be implemented. Ahead of the G7 summit, Trump told reporters that Moscow, which was ousted in 2014 from the group of leading industrial countries for annexing Crimea, should be reinstated — reforming the Group of 8 (G8). What they're saying: The fallout from the Trump-Trudeau G7 spat. How Trump's G7 body language speaks 1,000 words.